The viewing stands the Lodge uses after August 24th are in a good location on Knight Inlet’s Glendale River. 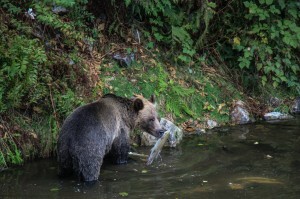 There is water on three sides full of pink salmon and the grizzlies come to feed. As this photo shows they do pass directly beneath the stands as they move from one fishing spot to another. These two grizzlies do not appear very large because they are two-year-old cubs while one adult would be the size of the two cubs combined. The road mentioned in the 26th post stops directly below the viewing platform and this is the location of the play fighting grizzly bears. They were beside our truck and spent about fifteen minutes enjoying some time in the sun. 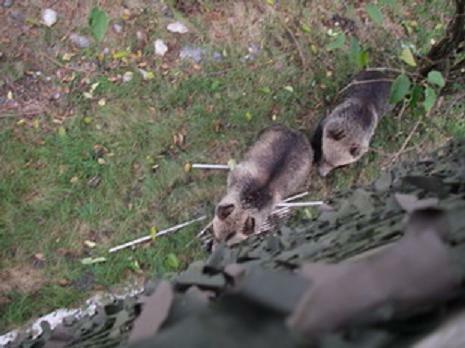 Once the hunger has been satisfied the younger bears often play fight to improve their skills. 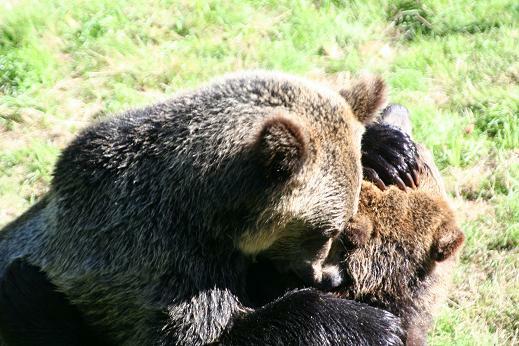 As they age grizzlies will fight with other males for the right to mate in a given area and also fight with females that refuse to mate with them. 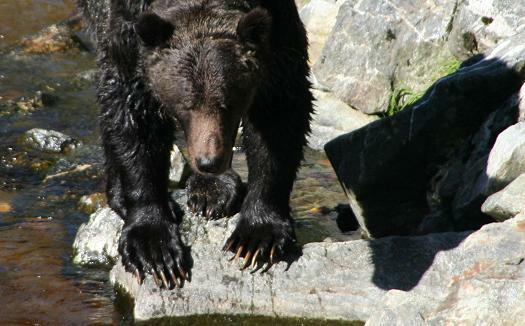 Grizzly bears have long nonretractile claws which are 5 to 10 cm (2 to 4 inches) but they are not good climbers. Their claws are used for digging, picking fruits, and catching prey. In this case the prey would be the many pink salmon in the entrance to the spawning channel overlooked by the lodge’s viewing platform. The road being blocked by this grizzly is the one we used to get to the Lodge’s viewing platform that we use after August 24th. The road is on a finger of land between the natural river and the entrance to a man-made spawning channel. This grizzly had just come up from the river and was crossing to the channel when it spotted a mother with two cubs fishing so this is more of an ALERT look than one of curiosity. This bear proceeded down the road well past the mother before going down the bank to fish and we were only a few minutes late getting to the viewing stands. The guests did not seem to mind the delay. By definition: A bait ball, or baitball, occurs when small fish swarm in a tightly packed spherical formation about a common center. It is a last-ditch defensive measure adopted by small schooling fish when they are threatened by predators. Herring are the reason we have successful marine wildlife tours. 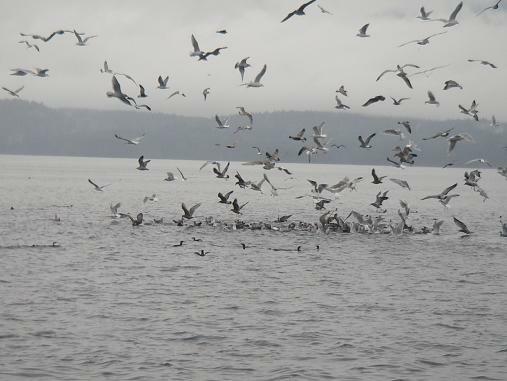 Herring balls are the food source of humpback whales, dolphins, porpoise, ducks, eagles and salmon. The salmon in turn bring the killer whales into the area every summer. The above picture is what your guide hopes to find and then parks the boat within camera range and waits for the humpback whales to lunge feed through the herring. 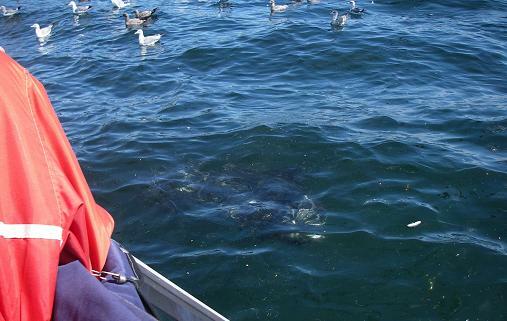 If it is possible to find a bait ball in an area away form the whales it is possible to move very close (as in the picture below) to see the herring. The bait balls vary in size from basketball size to boat size. Over the years it is not uncommon to watch Steller sea lions play with humpback whales but the behaviour exhibited in this picture was new. 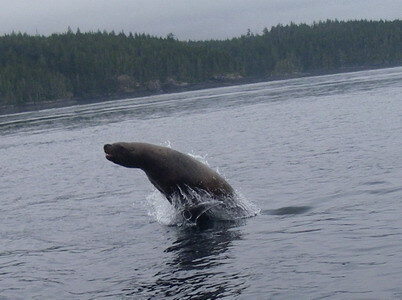 We were following a pod of dolphins when this sea lion came up on the other side of the boat breaching or porpoising like the dolphins. It was not just a one-time breach rather it followed the boat for at least a kilometer (mile) with continuous breaches. Another marvel of nature that is hard to explain. Compare this photo to the one in the September 12th posting to see they are the same type of dolphins – Pacific Whitesided Dolphins. In the 12th posting they are playing beside the boat but today they are working / feeding. The dolphins often work in pods to corral the herring and then take turns feeding but on this day it was a solo act. 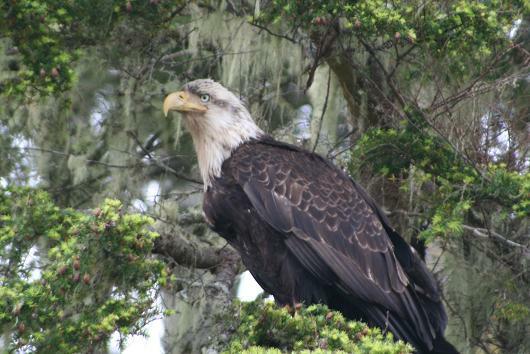 Adult plumage develops when a bald eagle become sexually mature; it takes five years for a bald eagle to attain solid white head and tail feathers. For the first five years they gradually change; the beak turns from black to yellow, the eyes from brown to pale yellow, body feathers from mottled to dark brown, and head and tail feathers from mottled to solid white. This eagle is close to maturity if you compare it to September 11th posting it’s head is not full white, the beak is not bright yellow or the eyes pale yellow. 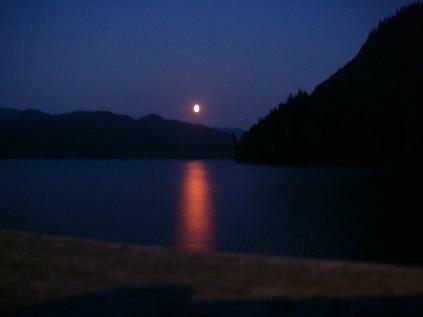 This photo was taken in early June in the Glendale River estuary of Knight Inlet. 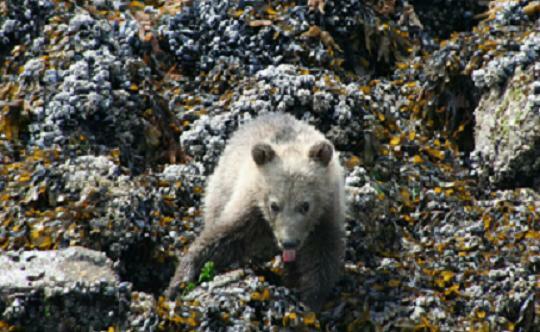 By the size of this cub it was likely born in late February making it a little over four months old. The advantage of the early season tours from our Lodge is the cubs are small about 10 kg (22 lbs.) when they first appear on the beach in late May but can easily triple that weight by July. No this cub was not alone it’s mother was about 5 meters (yards) away and it was very aware of our boat which changes after a month and they ignore us knowing there is no danger from the water. 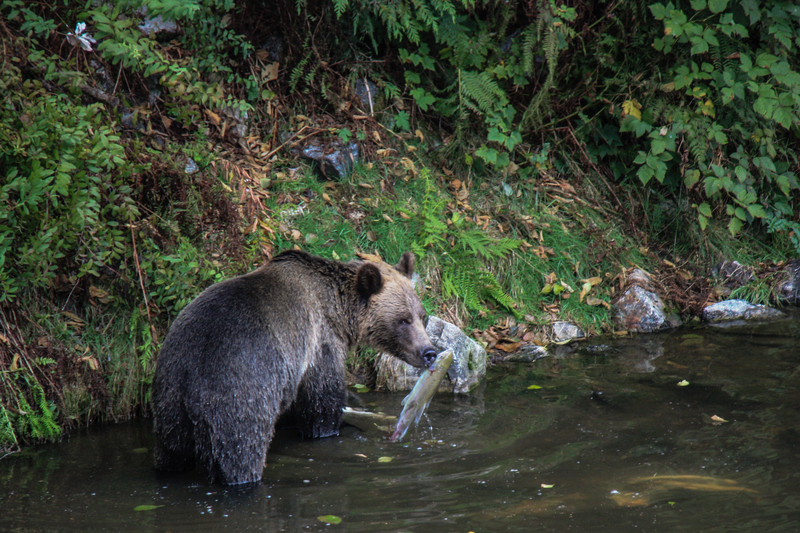 Grizzly bears that fish in the holding pool next to Grizzly Bear Lodges viewing stands on British Columbia’s Glendale River normally take the salmon to bank to eat because of the deep water in the centre of the pool. If you look closely there is another salmon by its front paw and several more in the water. Grizzlies fishing further up the channel often wound salmon, which later die and drift into the holding pool making it in ideal fishing area for the bears, which want to conserve energy. 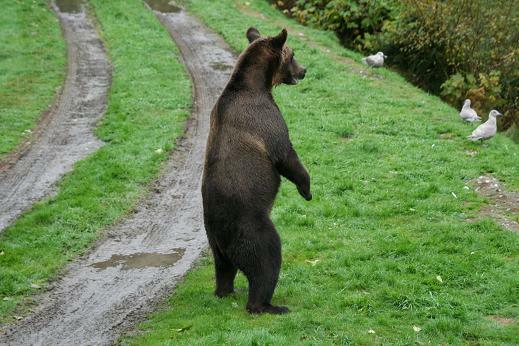 Bears are able to reach into the water and pull up salmon with little effort while grizzlies on the other side of the stand actually work for their catch.